O My! Now I’m a Real Estate Guy. Realty Income (O) is also known as The Monthly Dividend Company. And, O has been a popular stock in the dividend growth investment community lately. 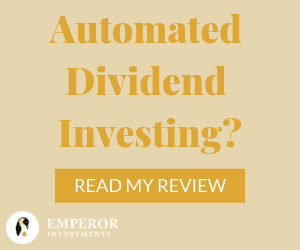 Let’s find out why with a dividend deep dive. The monthly dividend company is structured as a real estate investment trust (REIT). They make money through ownership of over 5,000 commercial properties that generate rental revenue from long-term net lease agreements. O’s customer base is diversified with 251 commercial tenants operating in 47 industries, located throughout 49 states and Puerto Rico. 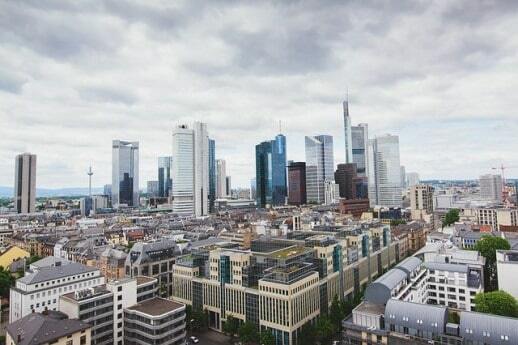 Their properties are generally freestanding buildings in prime locations with good access and visibility. You have likely been in one of their properties. Many of their tenants are household names like Walgreens, FedEx, LA Fitness and Walmart. Any business calling itself The Monthly Dividend Company has to be a friend of Dividends Diversify, right? As our friend, O is paying an annualized forward dividend of $2.628 per share. This represents a 4.96% dividend yield at the recent price of $53 per share. They announced this newly increased dividend rate on January 16th. Dividends per share have grown consistently in the mid single digit percent range over the past 7 years. In my eyes, a 5% current yield plus a 5% dividend growth rate is a pretty nice combination. I mentioned earlier that O is organized as a REIT. There are pros and cons for the investor as it relates to this type of business structure. As long as they meet certain operating metrics and distribute most of their taxable income as dividends to shareholders, they pay no federal income tax. This eliminates the “double taxation” of their income generated and the dividends they pass along to shareholders. On the other hand, the dividends received by the investor do not receive preferential tax treatment as qualified dividend income. They are taxed as ordinary income. Under current tax law, your tax rate on the dividends received from O will depend on your tax bracket. It could be as high as 37%. Due to this tax treatment, it may be best to hold REIT’s in an IRA or 401k. That’s what I do, but consult your tax adviser to understand whether it’s better for you to hold O in a taxable or tax advantaged account. 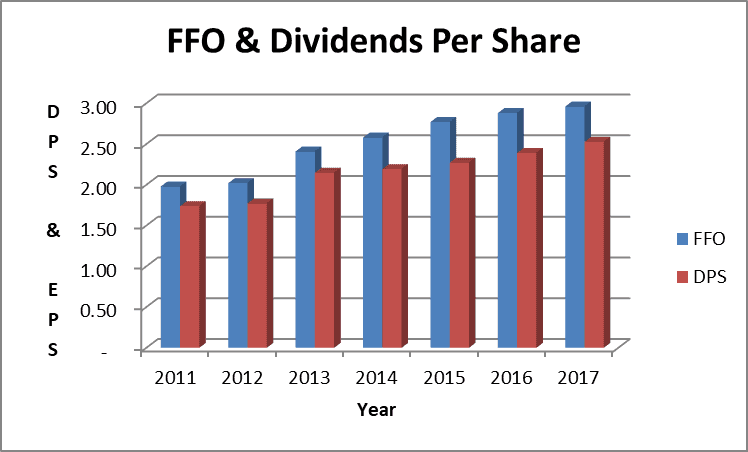 For REIT’s, funds from operations (FFO) are a better measure of dividend payment capacity and earnings than traditional earnings per share. O boasts of stable and consistent FFO growth in their investor materials. You can see the consistent growth on an annual basis in the above chart. Dividends as a percent of FFO generally run in the mid to high 80% range and grow along with earnings. O states that they grow earnings in 2 primary ways: 1) increasing the size of their real estate portfolio and 2) increasing rents over time. O’s stock price peaked in the low 70s in mid 2016. At that time, interest sensitive stocks were benefiting from the anticipation of interest rates staying lower for longer due to sub par US gross domestic product (GDP) growth. Higher GDP, jobs and wage growth have led the Federal Reserve to slowly raise interest rates putting pressure on O’s stock price over the past 18 months. Consistent growth in FFO combined with a falling stock price have resulted in a lower valuation. 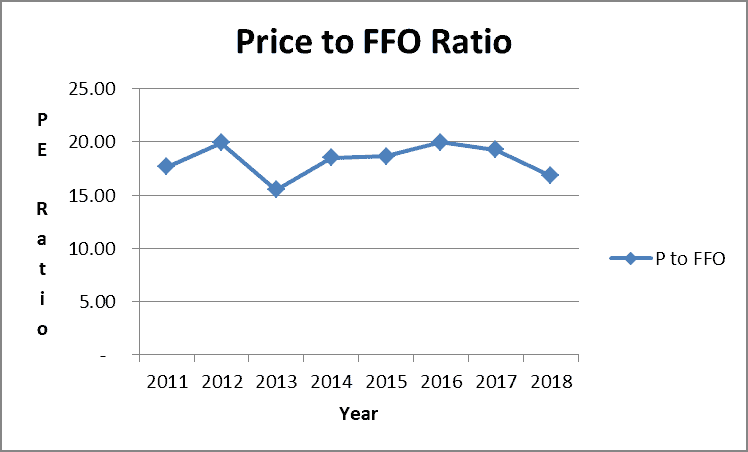 On a current stock price to projected 2018 FFO, the price to FFO ratio stands at a little over 17. This is the low end of its recent historical range. One business risk is worth mentioning, in my opinion. Many of O’s tenants operate in the retail industry. Brick and mortar retail is under continuing pressure from online retailers like Amazon. This industry dynamic may decrease O’s future ability to grow like it has in the past. I think O represents a reasonable value below $55 per share and I recently added to my position at $53.21 per share. 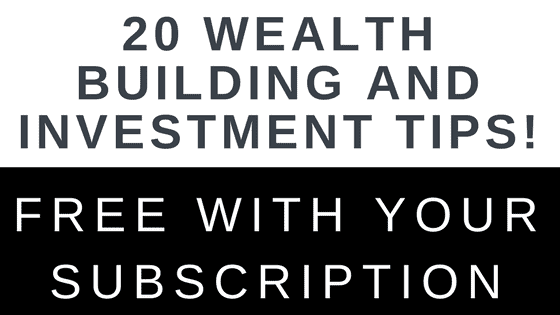 Realty Income is also featured in this review of three great stocks for income, income growth and capital appreciation called the Triple Play. Do you own O? Do you think the monthly dividend company is a good investment? Or, do you think the changing retail landscape will put pressure on their ability to grow profits into the future? Do you see any other risks that I haven’t mentioned? Leave a comment and let us all know! How can anyone in the community not like a security with the name “The Monthly Dividend Company” 🙂 ? In all seriousness, I think O is a great name to consider in most portfolios. Your mentioning of tax consideration and account choice is very important as well..
We do not currently hold O as an individual name (and likely will not in the future), but we do have exposure to it via our Vanguard REIT Index holding. Nice post Tom. I don’t own O, but it is one I have looked at in the past. Seems like a lot of people have been snatching it up lately. And the fact that it is a monthly payer is kind of interesting too. It sits on my watch list as of now. I love the yield on O. However, I worry about the long-term risk to retail from online shopping. I myself shop almost exclusively online, and think this is the future (it’s just too convenient). I think FedEx and LA Fitness are probably good tenants that don’t face a huge threat from online shopping. But I wouldn’t say the same for retail outlets like Best Buy and whatnot. Even so I have rental properties, I do own some Canadian REIT, in my TFSA for tax efficiency. No room for US REIT at the moment but great analysis Tom. I guess I better make sure I post about my rentals often enough to keep you coming back! That sounds good to me. You must have at least a dozen or so tales you could tell. Big fan of O as seems like the rest of the community is as well. I know a lot of people jumped at the chance to buy it on the current dip. Thanks for the detailed analysis. Looks like good value. I’m not so convinced the bricks and mortar retail industry will crumble. So many people still love getting out and about to do their shopping, instead of being stuck in front of a computer. I think malls and shopping centres will adapt, and keep trying to improve the ‘experience’ for visitors. . I love monthly dividend yielders. 4.96% is a beautiful dividend amount. BEAUTIFUL. I’ll have to take a look at this one. I have a Canadian REIT but it’s down a bit right now, all the REITs are being hit right now because of the interest rates going up. You are very ‘punny’ Tom! I seriously had to look up this company because for a minute I thought you were disguising its name with an “O”. The only O I know of is Oprah. We don’t own O, but we do have a few dividend investments in our taxable accounts. For us right now it’s the best way to augment Mr. Groovy’s small pension and to manage our earnings for Obamacare. I must have been SUPER slow when I read this post last night. I was SO tired that your title didn’t click… Now that I’m reading your post again, I see the connection with your title, LOL!! No problem on missing that little title pun Ms. Panda. I’m sure you are not the only one. Not everyone is familiar with the company Realty Income either. It’s a really well run business from what I can tell. On remembering, I’m like you. I forget stuff really fast if I don’t use it continually. Actually doing this post made me refresh on FFO too. I have owned O stock for a few years now and I believe this is a great company. I know Amazon has really changed the landscape, but this company is a well-run machine. Your post was very detailed and I hope others will consider buying this stock. Nice post Tom, I don’t own any but do own Canadian REITS in my tax advantage accounts. I like the diversification REITS can have on your portfolio. Seems like everyone is buying O right now. I wonder how REITs will react if the interest rates keep rising this year. I’ve been mainly sticking to index funds with REITs but am keeping an eye out on some good individual names. Great article Tom. Despite any skepticism, I am a fan of O. I wish that I would have held my position years ago and not sold it. I have a very small exposure to REITs but O is one that I feel very comfortable owning. Only time will tell how the retail trend will affect Os tenants! Thanks for sharing Tom. Nice post Tom. I would for sure want that bad boy in a tax advantaged account that is a fat yield! Nice and very detailed post analysis for O. I liked it. I don’t own O myself but have looked into it myself several times without being share holder. However, lately I have been eyeing and buying REITs and Utility sectors so hopefully one of these coming days I may initiate position in O. Its a great stock and if its at this price when i get our tax return it might be a new position for us in our rrsp. Like frankie says retail isnt dead. I like to go shopping to people watch and get out of the house. I love the deep dive Tom. Realty Income is one of my favorite stocks and currently represents 7% of my portfolio. The main downside for me is the tax treatment which you pointed out. In terms of the pressure that’s on the retail industry, I think retail companies are starting to adapt. But, only time will tell to see what effect it has on O. Once I get through a few more hurdles with the Airbnb, I’m going to revisit our local market for another LTR. If the market is still over-heated? REITs here I come…. Hi, Tom. I’m an O shareholder, and see O as a long-time holding. I sold a portion of my stake when O crossed $70 in July 2016. I then bought about two thirds of it back this past May below $56. While I don’t anticipate adding more to my REIT holdings just now, I’d most likely add more O if it dipped under $50 – not so far away here, so certainly a possibility. I enjoyed your write-up, and the O background you provided. Take care. Nice post and argumentation Tom! I also bought additional shares, alas befor the dip but still. Upped my position to 10 shares. If I make my february buy I will consider them again. Hi Tom. I somehow missed this post last week, glad I saw it today. My broker’s portfolio analysis suggests that I need more REIT exposure, and thus I have been watching several REIT stocks, including this one. I agree with some other commenters that the Amazon threat to retail is overblown and misunderstood. Moreover, O seems insulated to an extent because their portfolio has service-oriented and other businesses that are probably not going to be impacted by Amazon and online retail in general. Nice addition to your portfolio, and smart to add it to your tax-advantaged account. I have been looking at Realty Income for a while now too. However, I’ve decided to pass for now given their exposure to retail and the current economic cycle (closer to the top than bottom). Fun fact: Realty Income owned the building at my last job (we worked directly across the street from their headquarters). I actually befriended one of the maintenance guys from the building…and he had to wear a uniform with a patch that had the words “the monthly dividend company”! Just some scuttlebutt, but people seemed to be happy to work there. Most people only work about 8 hours a day and they typically get Fridays off or only work half days on Friday!